Notes: John Barr created this pattern in 1975 while fishing upon the Nelson's Spring Creek in Montana. Noticing that he was getting little interest in a PMD hatch with his dry patterns, he used a nymph and finally caught a trout. Upon pumping the stomach, John noticed that partially hatched nymphs with the shuck still attached were present on the back of the trout's tongue. John developed his emerger pattern based upon the appearance of these partially developed duns and created his "Barr's Emerger". Colorations were adapted for both PMD and BWO mayflies. 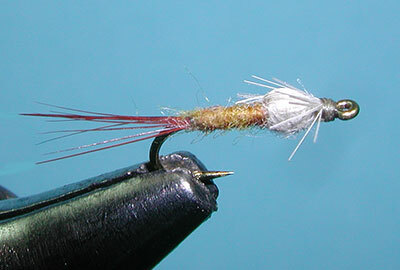 John uses both a nymph version tied upon a TMC 2488H larvae type hook and a dry version using a TMC 101. The dry version tends to have a longer tail section. The nymph version will be used when there is no visible hatch, if one sees surface activity, John will switch to the "dry" version which lies within the surface film. Later versions of John's pattern include the use of a flashback material or a bead. The flashback tends to be John's preferred pattern in most situations. One of the attributes of this pattern that became known, is that the trout do not seem to shy away from it after it has been used a number of times. John has had occasions where he caught the same trout using the same fly. 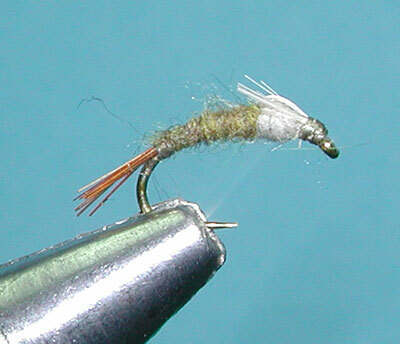 Another attribute to this pattern is that it imitates both an emerging mayfly and a mayfly cripple. 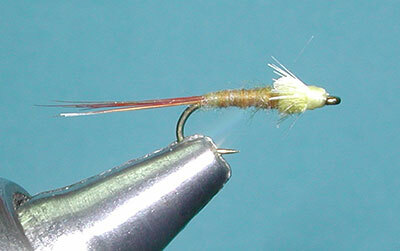 This emerger pattern tends to be a favorite among many of the Sierran streams during BWO and PMD hatches. Since the "dry" pattern is difficult to see on it's own, it is often used as a dropper from a visible dun pattern. 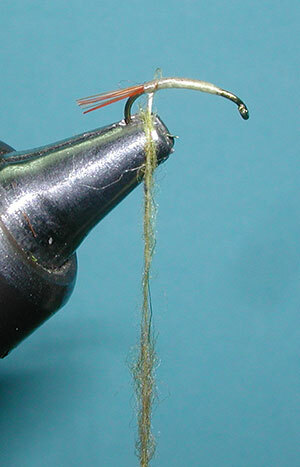 The nymph type can be used as a similar dropper or as the third dropper as in a hopper-copper-dropper set-up.